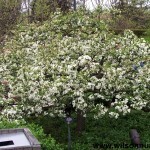 A dense, fine-textured tree with a symmetrical, globular head that maintains its shape with minimal pruning. 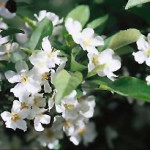 The profuse white flowers are followed by small yellow fruit. Very good disease resistance. Dark green foliage throughout the season. Heavy blooming, with large bright fuchsia-pink flowers that are striking in springtime. Dark green foliage has a red overlay. 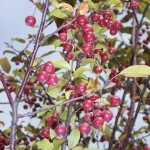 A vigorous grower with upright oval form, it features bright red fruits in autumn that persist into winter and become bird food. 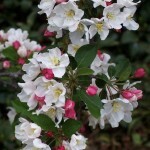 Starlite Flowering Crab is draped in stunning clusters of fragrant white flowers along the branches in mid spring, which emerge from distinctive red flower buds before the leaves. 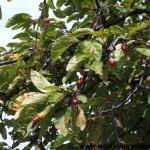 It has dark green foliage throughout the season. The glossy pointy leaves turn an outstanding yellow in the fall. The fruits are showy red pomes carried in abundance from early to late fall. Grows best in full sun It grows best in full or partial sunlight and prefers well-draining medium-textured soils with adequate moisture. Compact, round, spreading form. Slow growing. Reddish pink buds opening to white flowers and a large amount of small persistent bright red fruit. Excellent for small locations. 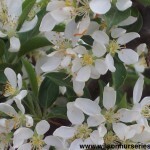 Excellent fireblight and apple scab resistance. Horizontal, spreading form. Dense, shrubby with laced branches. Usually twice as broad as wide. Red buds open white. Low growing dwarf variety. Easily trained. Persistent fruiting. 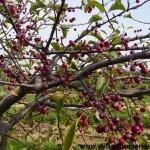 Small 1/4″ – 3/8″ bright red fruits, favored by birds. 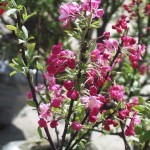 Valued for it’s shrub-like form, outstanding pink flowers and bright red fruit. 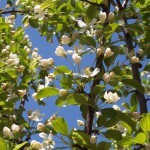 A cultivar of Malus sargentii which is a little smaller in leaf and habit. Buds are dark pink opening to white blooms. Beautiful display with a candy cane-like contrast from the pink buds and white blooms. Flowers profusely and sets many orange-red berries. Slow growing. Excellent as a specimen tree. Profuse white flowers. Elegant form, with slender limbs spreading horizontally from upright branches. Deeply serrated leaves give the tree a finer texture than most crabs. 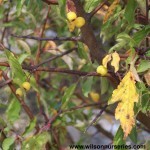 Abundant 1/4″, tiny, golden yellow fruit in fall. Very disease resistant. 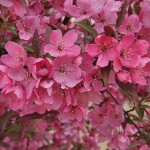 One of the best red flowering crabapples, with rounded, dense habit. Very disease resistant. Foliage green with reddish tint. Persistent 5/8″ carmine-red fruit. Deep pink buds open to single pink flowers. Soil should be moist. 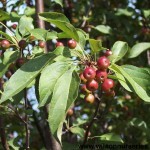 A spreading, upright crabapple with dense growth habit and good, dark green foliage. Pink buds open to single white flowers. Blooms profusely. 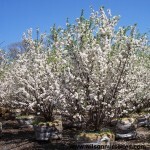 The blooms and persistent, 5/8″ bright red fruit provide an excellent fall display. The smallest dwarf of the ‘Round Table’ series. Extremely compact, upright, oval shape. Tiny red buds open to snow-white flowers. 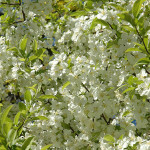 A dwarf, petite, white flowering crabapple. 1/4″ gold fruit. Very disease and pest resistant. Deeply lobed, green foliage. Requires no trimming or pruning to maintain its naturally symmetrical form. Coral-pink buds open to double rose-pink flowers. Dwarf, compact, very dense, symmetrically rounded shape. 1/2″, reddish orange fruit. Tiny , dark green leaves. Very disease resistant. Slow growing. Red to pink buds open to masses of white flowers. Very showy. 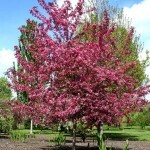 Persistent, glossy, 3/8″ bright red fruit is among the most persistent of all crabapples. Glossy, medium green foliage remaining in excellent condition throughout the growing season. Good resistance to diseases. Lavender-pink flowers. One of the earliest crabs to flower, and the bloom stage is longer lasting than most. Foliage is purplish red in spring, turning green-bronze in summer and copper in the fall. 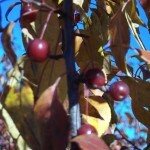 1/2″ persistent purplish red fruit in fall. 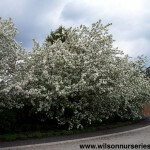 Dense, upright branching gives this crabapple a symmetrical oval form. 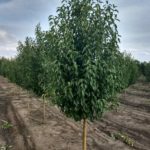 New leaves start out with a reddish maroon color and mature to a rich, dark green. Very good foliage retention through the summer. 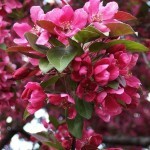 Blooms later than most crabapples. Small 3/8-1/2″ dark red fruit does not drop. Glossy dark red bark. Dark reddish-purple flowers have white centers. Very popular, Upright, spreading form. Medium texture. Vigorous growing habit. Purple spring foliage turning bronze-green in summer. Dark reddish purple flowers have white centers. Persistent 1/2″ glossy red fruit. Excellent disease resistance. Small & deciduous. 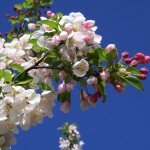 White, fragrant flowers emerge in April. Beautiful red berries persist through winter. Good resistance to fire-blight, rust and black spot. Rounded to pyramidal shape as it matures. Magenta pink blooms over purple cutleaf foliage. Turns brilliant shades of bronze, orange and purple in the fall. Wildlife enjoys the bright red berries which also add winter interest. Upright, spreading habit. Upright shape becoming rounded and gracefully spreading. Large, rich green leaves, dense canopy. Buds pink, opening white and fragrant. Persistent fruiting. Very popular, widely used and time tested. Excellent, dependable tree. A good, strong growing crab with beautiful pink buds. Quite fragrant. Green foliage is quite resistant to spring and summer funguses. Dense-branching, upright-spreading form. Yellow and orange fall color. Bright red fruit may last into spring.